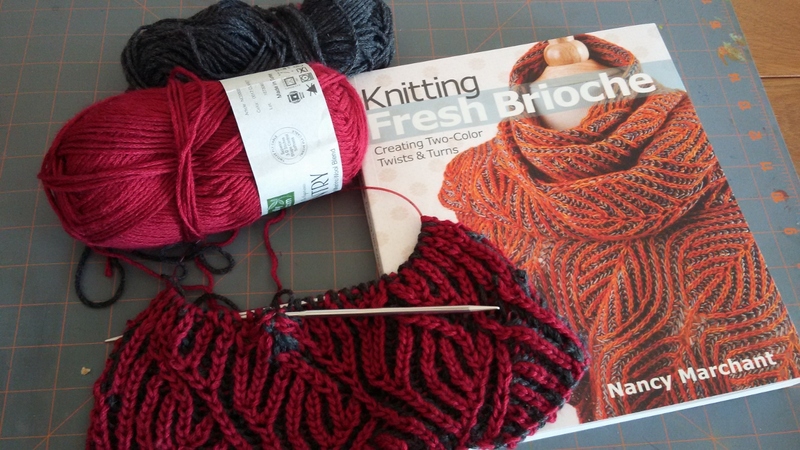 I like the Brioche style of knitting and wanted to make another project using this method. Pinterest and Ravelry had the usual selection of patterns, many of which came from Knitting Fresh Brioche, by Nancy Marchant (available from Amazon). Someone knows how to improve rankings on social media and search engines, it seems (I’m not complaining – they are lovely patterns). I did purchase the book – partly because I wanted to study the method, and partly because there were patterns I wanted to try. So, swatching commenced. It took a frustratingly long time for me to get the hang of the technique. It’s not hard – really – but it takes a tilt in thinking from conventional knitting. I started the swatch pictured below about 6 times before I get to the point you see – and then dropped some stitches (which is where I stopped). I felt (finally) confident enough in the technique that I moved onto another project. One thing to keep in mind about this technique is that there are four rows for every round – one for each color back and forth. You are knitting with Main Color then Contrast Color in succession. Don’t use the Italian Cast-on (I’m not even going to link to it) as recommended by all the instructions (written and video) that I reviewed. That was about 3/4 of my problem – that is too loose and unstructured for the technique (in my opinion). Use a version of double-knitting cast on. 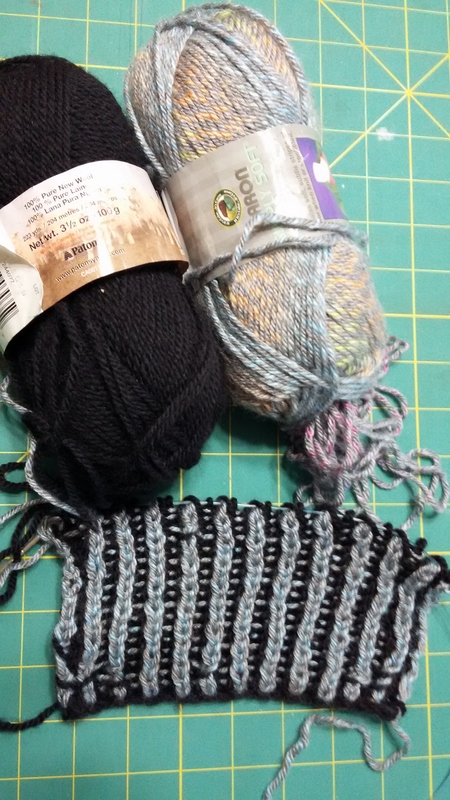 I looped both colors of yarn together and did a long-tail cast on, but twisted the colors at each stich, so the effect was alternating colors in the cast-on, and the cast-on row had plenty of give to match the project. Set markers and pay attention to stitch count. For some reason, it is very easy to add or subtract stitches in a row without noticing. Markers are helpful to maintain your place. Use a lifeline. I say this guardedly – with this style of knitting, a lifeline is very helpful. If you drop a stitch, it is very difficult to recover. However, even with a lifeline, it’s challenging to keep the stitches in line. Consider using a needle size larger than the yarn calls for. I haven’t completely confirmed this suggestion, but it does make knitting a bit easier with more “room” in the stitch. Practice. While not difficult – and there’s really only the first pattern row of each four-row set that requires close attention – I really had to practice to get my hands used to the pattern and flow of the project. Sample below. I’ve moved onto a project from the book, which I’ll post shortly as I get some length to share. I’ve been intrigued by the recent jump in Brioche projects I’ve seen on Ravelry and Pinterest (Yes, I know that the more you look at a topic, the more it’s pushed into your feed. That’s not entirely the cause, I think). Here’s a helpful video from Staci at Very Pink, where she also posts written instructions. Here’s another helpful video – it is video only (no sound). I used this when I practiced because the demonstrator went very slowly, and I could keep up when I was first struggling through the technique. You can click through to written instructions through the description section of this video too. The instructions with this second video include brioche in the round (on circular needles), which is the nature of the project I have in mind for the application of this stitch (and that yarn below). Though the technique and the stitches are identical, there is slightly different terminology, and Staci includes an extra slipped stitch on one end, so if you refer to both sites, don’t get them confused. Current question: I used a knitted cast on for this swatch. The instructions recommend long-tail. I’m not sure either is stretchy enough to accommodate the give in the stitch. I’m going to try Jeny’s Slipknot cast on method, to see if that helps. Here’s my most recent swatch. This is such a loose and squishy fabric – I think I may need to go a needle smaller for the project. I’m going to rip this back and try swatching in the round to see how I get along. Theoretically, it should be easier, since the “back and forth” stitch is a 4-row stitch and the circular version is a 2-row stitch. But for the pattern I have in mind, I also need to learn to cable in brioche.